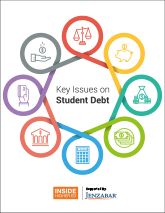 “Key Issues on Student Debt” is Inside Higher Ed's newest curated collection of articles. You may download a copy free, here. And we invite you to sign up here for a free webcast on the themes of the booklet, featuring Inside Higher Ed's editors, on Tuesday, July 10, at 2 p.m. Eastern. Register or find out more now. This booklet was made possible in part by the advertising support of Jenzabar.